How can you have peace of mind during the next big storm? Our friendly and knowledgeable staff is ready to answer all your sales or technical questions. Call 606-474-9059 for more information. Schedule your necessary maintenance with our Factory Certified Service. We also provide warranty repairs. from sales to service and installation. 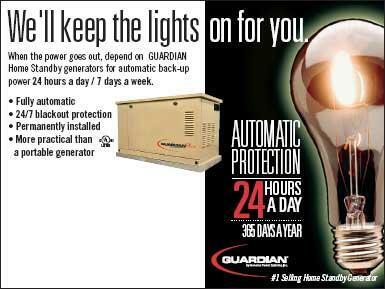 The Guardian/Generac Home Standby Generator is an automatic system that produces your own electricity as soon as it senses a power outage – 24 hours a day, 365 days a year. 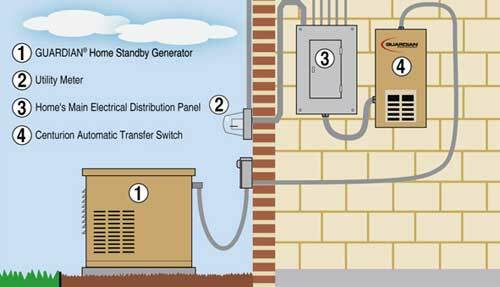 Easily installed next to your home or business, your generator starts automatically whether you’re home or away. Fueled by natural gas or LP supply, these generators don’t require extension cords, messy gasoline or prior planning. You and your family will have the emergency power to be safe, secure and comfortable everyday! For less than the cost of central air or a plasma TV, you can protect your home or business with an Automatic Standby Generator. A one time investment for a lifetime of security. Buy a generator today and never worry about a power outage again. Contact us at JMK Electric for more information! WARNING: Connecting your portable generator with extension cords, tapping into lugs on your electrical panel, or plugging into an outlet in your home is very dangerous. It could back feed into the utility lines potentially injuring or killing a family member, neighbor, or utility crew working to restore service. JMK Electric will be happy to GENERATE peace of mind and review all options with you.